I'm the owner of a BB1 Supermono, its been in my family for some time (since early 2000's), was regularly ridden by my mum, who I took up ownership from. A lot of the issues have previously been looked into by others, however I want to try and bring the bike back again. As information is proving difficult/scarce, i'm hoping this thread can go some ways towards addressing some of the issues i encounter and how to rectify. 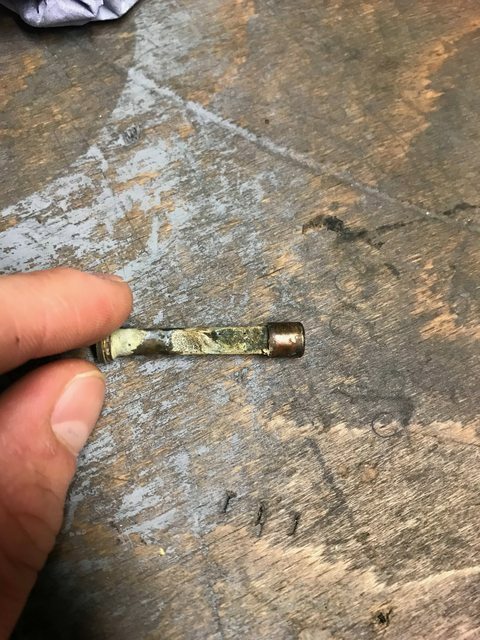 1.2 Problem — Brass Choke pipework has sheared away from the carb body, from reading, this appears to be a very common problem on most engines with the f650. but also most bikes with the BST carb variant. Bike will likely have been overfueling for some time. 1.2 Solution — Some RC hobby shop brass fuel line (3mm OD) with a 4mm OD sleeve for the top hole) should allow for a new pipe to be installed. Possibility of adding a small plastic pipe break within the brass to absorb the vibration, hopefully preventing the shear in the carb body. 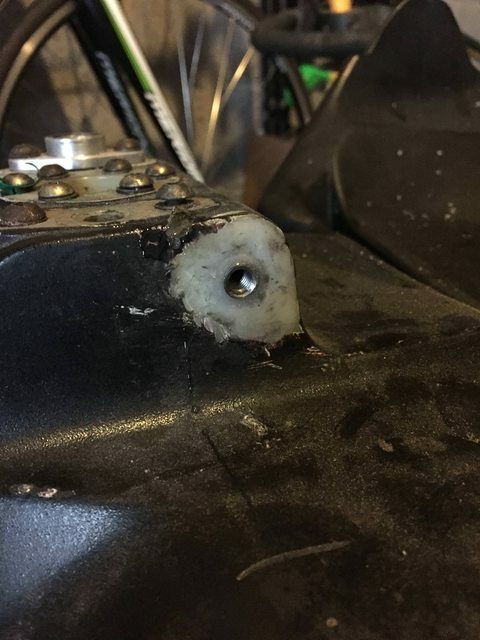 1.3 Problem — Fuel Tank captive nuts have become rounded and are rotating within the hole. 1.3 Solution — Grind out hole, strong adhesive and re-install captive nut flush with tank. 1.5 Solution — Replace with new. Pump is common pump across what appears to be 90% of the Fiat, Alfa, Lancia range. cheap and available. 2.1 Problem — Vapour Pockets have appeared all over all panels, where it is believed the curing process was not complete in manufacture. I believe the cure for this is a full respray, the pockets of vapour cannot escape. 2.1 Solution — I’ve spoken to a couple of bodyshops who have described the paint job of the bike as 'poor' and 'probably done with a rattle can', which they then backed up with evidence of spray pattern and style, along with the silver being identical to over the counter alloy wheel spray silver! Helpful advise seemed to suggest that the curing process had not been allowed to completely finish, and putting the panels in a paint oven to cure (properly) would then show the full extent of the issue. 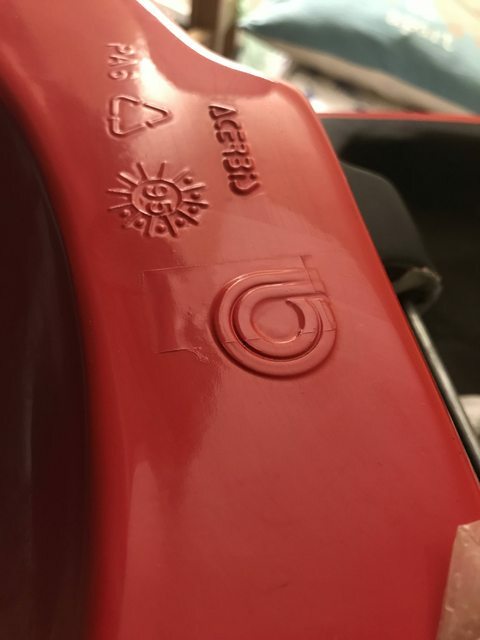 I'm pretty sure ill be respraying it. So any help with Colour Codes or colours you've had success with would be great please. 2.2 Problem — Bike was dropped during a house move, luckily only a minor impact to the side panel, will need repair and repainting. 3.1 Solution — Easy fix with Apilia 650 Pegaso, of the same era, lever (shared component). 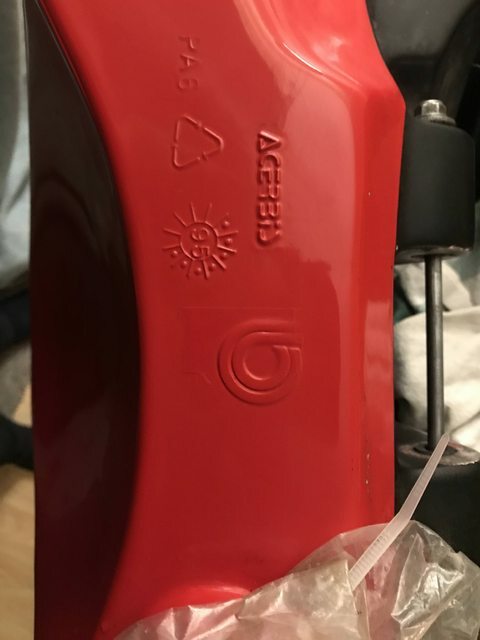 3.2 Problem — Left-hand side (when sitting on bike) mirror/indicator unit has been badly damaged. 3.2 Solution — Try to source replacement, could do with some help on this one. I know the part is shared with the Gilera CX125, however that's hardly a common bike, so is almost useless! Help?? So all in all, not a huge amount of work! just time to do it all. Ill try and address each solution in a separate thread post for my sanity. 1.1 - Carbs have been stripped, uncovered the emulsion tube and O Ring on both carbs have never been removed, and it's absolutely clogged/useless. so will require replacing. 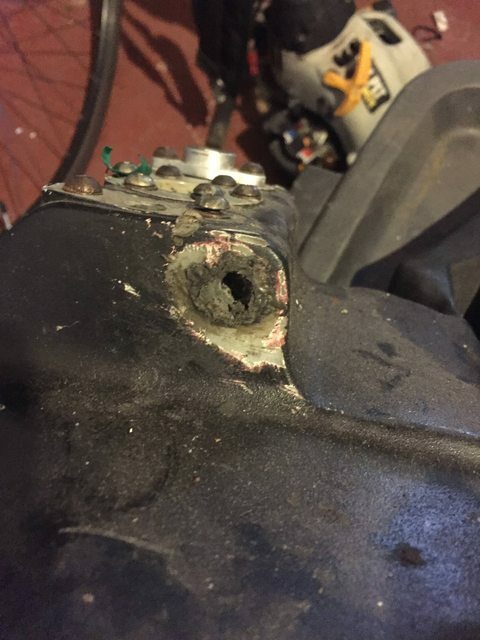 I would imagine this would be another reason for the poor running/idle condition of the bike. Complete rebuild kits will be sourced shortly. 1.2 - After looking for small barb ended cast brass parts from model trains/planes/cars, nothing was coming up sadly. Despite being able to see the part I would ideally like on smaller Chinese made carbs for strimmers/chainsaws etc etc. So I’m back to the original solution of buying a small length of brass tubing bending it carefully into shape. As its such a common issue, Im tempted to see if its a re-manufacturable part that all BST carb overs could use. If you’ve got a BB1. its worth checking this as even with the carbs off its just about noticeable. 1.3 - Sorted, ground out, adhesive in, nut inserted, left for 48 hours, job done. 2.1 - After looking through the BB1 register, there appear to be very very minor differences in the ‘line’ of the silver/red changeover on the bodywork. Going to attempt to find a decent colour match over the next few days. 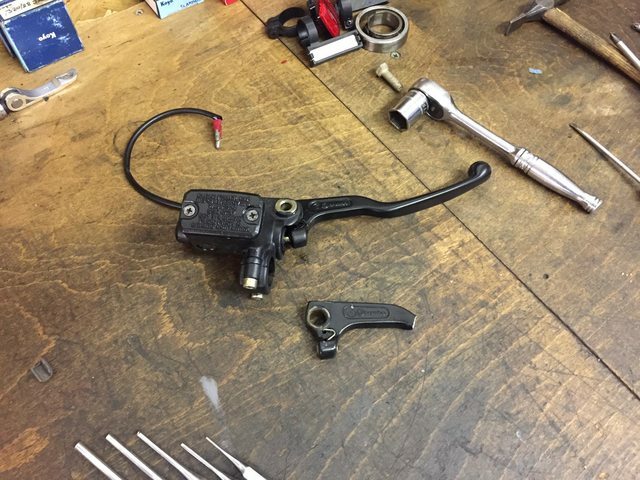 3.1 - Brake Lever has been replaced, simple enough job. we can't see the pictures, you should use Hostingpics to upload them ! Will change over now! i've never had an issue with photobucked before, but will change now. Thought I would try and illustrate the issue with the carbs. It appears best in black and white, you can see where the brass pipework has sheered, where it has been flared larger. 3mm internal diameter to 4mm Internal diameter. 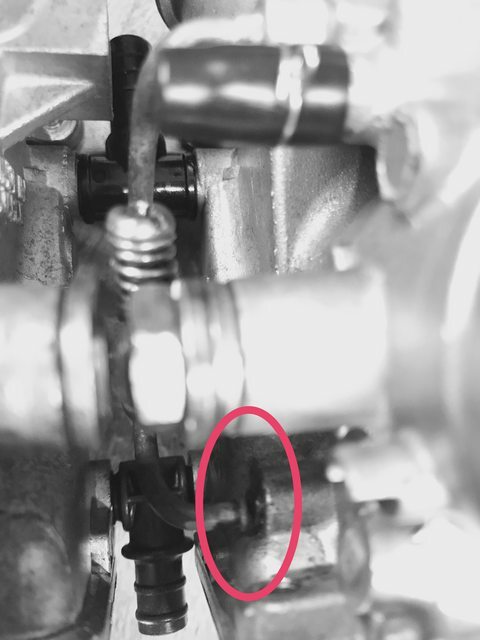 have seen this problem on the BST40 carb from Mikuni too. Finally, a nice photo of the bike itself, mid strip down. 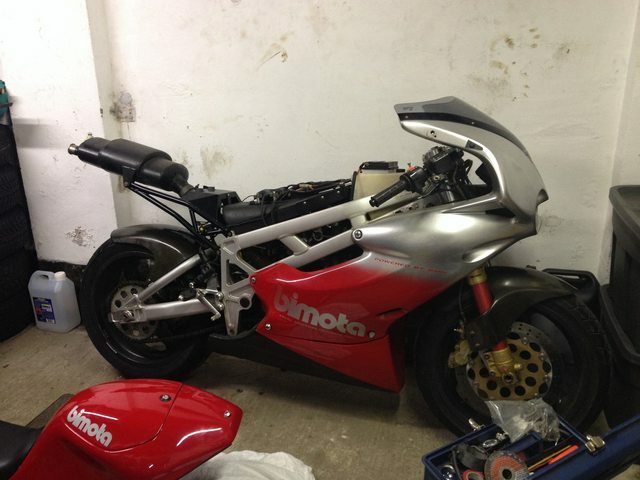 Well done John, great to see a sad and neglected Bimota being given the tlc it deserves. Good luck with the project. The brass pipework has arrived, 4mm and 3mm. Going to sand pack them and make a test fitting set this weekend. 2.1 - VERY happy about this. Went to the paint shop last weekend to try and test match Bimota 'Supermono Red'. Lad at the shop insisted it was 'VW Flash Red' and to his credit, it pretty much is; See for yourself. Hi John... How is the restoration coming along? Are you still looking for the mirror/indicator? You can find them here..
Good to see a BB1 being brought back to life , they are a timeless beauty . Thanks for the link to the mirror, im sure translation isnt too difficult and if he's got a +1 from people on here then it should be ok! Sadly the project hasn't progressed an awful lot, about a week after my last update I managed to suffer a Lower back inflation and hip ligament strain, so have been out of action for a while, i'm about 2 weeks off being ok for action again so that can all be picked up again. Hopefully a more fun update soon!